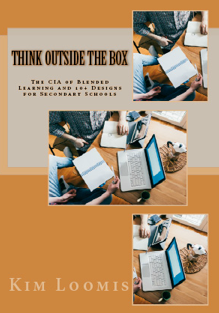 See Amazon for book: Think Outside the Box: The CIA of Blended Learning and 10+ Designs for Secondary Schools. You had a goal of having a third of your 320,000 students in an online or blended learning environment by 2015 and when we last checked-in, CCSD had exceeded that goal. Where are you now in terms of online/blended enrollment? 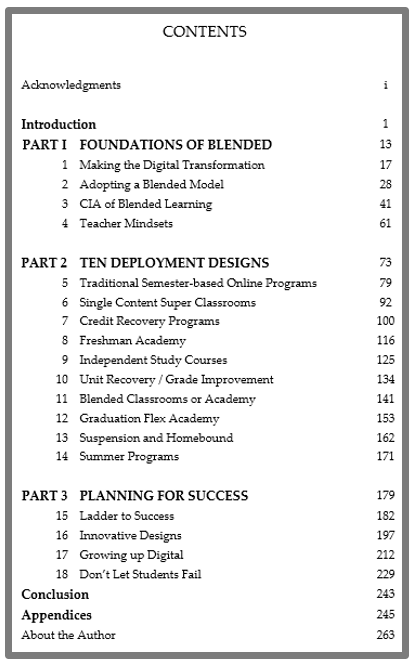 How have your online/blended course offerings expanded in the last 18 months? You utilize Subject Matter Experts (SMEs) for creating the content you distribute, reviewers to make sure the content meets Nevada Academic Content Standards (NVACS) and project coordinators to make sure everything is organized and properly distributed – how has this curriculum design team evolved over the past few years? For those who may be unfamiliar, describe how you created your schema and why you felt this was the best approach in planning out and organizing your content. I imagine that there has been an audit of sorts for both the curriculum and processes since implementation – what have been the biggest successes you’ve seen from these overall reviews? What challenges or areas for improvement have these reviews brought to light and how have you addressed them? You integrated a lot of technology into this program to make it comprehensive and modern but, as we all know, technology is an ever-changing market – especially in education – how have you kept up? Since implementation, what has the response been from on-the-ground teachers utilizing the curriculum for their classrooms (blended or online)? What about students? What new doors or opportunities have opened for them with this increased flexibility and access? For other schools looking to implement an online or blended program at their school, what advice do you have for them as to how to begin? Can you tell us about the District Virtual School? When and how did that get started? What kind of structures are is in place there? And can talk about how that program eventually grew and evolved based upon your District’s goals? Can you tell us about the work that your team does around district-developed courses? And can you provide us with some details around the online/blended teacher certification program? Lastly, can you tell us where folks might go to learn more about the work that CCSD is doing around online and blended learning? Share your current work, and the problem you’ve been trying to solve with your work. Most achievers have a close relationship to failure. Can you let the audience in on a failure you experienced, and how you (and the company) have been able to grow from it? What gets you most excited about the future of learning? What gets you most frustrated about the future of learning? What is the book that most influenced you and why? Does not have to be education related. If you could have dinner with one person you admire, past or present, who would it be and why? Blended learning is having a positive impact in schools and districts across the country, but there are a number of key strategies that can advance blended learning to its next generation of even greater effectiveness and improved achievement. In this webinar to learn from Tom Vander Ark, CEO of Getting Smart, the latest trends and best practices in blended learning, and Kim Clark, Director of Innovation for the Clark County School District in Nevada, who will share her experience successfully launching blended learning in her district. At the Clark County School District in Nevada, administrators plan to transition 100,000 students—one third of the student body—into an online or blended learning environment by the 2015-2016 school year. Listen to this web seminar to learn strategies from Clark County’s innovative projects coordinator about the keys to implementing blended learning from an administrator’s perspective, the most predominant implementation models, and a practical 4-step approach to creating a successful blended learning environment in any district.